Whilst others draped in flowers, just a date was etched on there. The grasses faded yellow as the wind whipped up-then passed. And wondered how it came to be without a name- forgot?! Yet still- the air, dissolved the day, for now it had got late. Awoken from my hazed-dazed state was how i'd spent the time. And just as quick I thought to lay them, something told me 'No'. A single rose of purest white growing beneath a tree. where two sets of initials inscribed, "Never will we part." Be bold, take a chance and add your own .2¢. Whether you have a poem, short story, or comments based on one of the prompts - everyone is encouraged to participate. It's fun, it's informal, it's realtime ART in the making! 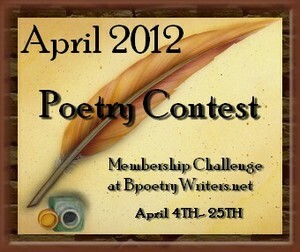 The April 2012 Poetry Contest! "A place I can call my own without the hassle of full membership!" I went for a walk just to enjoy the day. The path I took was a country road far from home. standing all alone against a backdrop of afternoon sky. I stood still pondering it, wondering of it's beginnings. 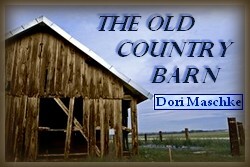 "That old barn has been in my family since 1910! I'm having her torn down. She's old and an eyesore to boot." it keeps them safe and warm. Please reconsider. Look . 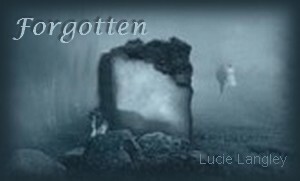 . ."
an old owl perched in the cove of a long gone window. safe and warm in the shelter of his old barn. ...............................................................................................I sit in a room of silence behind the door. ...............................................................................................Then one night she slipped away, after opening her eyes and saying goodbye. ...............................................................................................But then the doctor came to call, and he noticed the silence of it all. ...............................................................................................Hoping He will take me away, I sit in the room of silence and wait. ...............................................................................................I do not want to stay here another day, not now she has gone away. 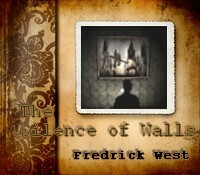 ...............................................................................................But all I have is silence in walls that will ... go away.